If you think there’s absolutely no reason an addictive juvenile smart phone/tablet game – or app (whatever you want to call it) – should be turned into an animated feature, you’d probably be right. But, that doesn’t matter. 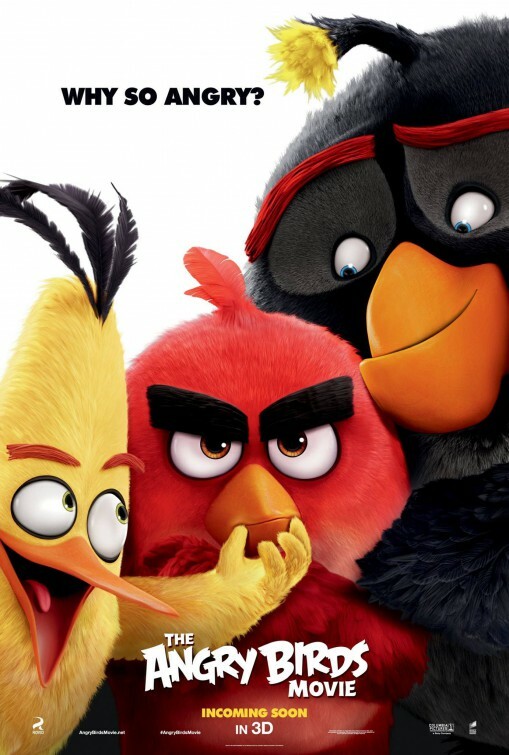 By now, you should know Hollywood will try out anything, which is why we have “The Angry Birds Movie” from Sony Pictures Imageworks, released the week a trilogy of movies revolving around Tetris was announced. The only thing: Hollywood is too slow. This movie is so four years ago. Now, after thirteen different versions of the game (including Star Wars and Transformers themes) and three spinoffs have been released and the merchandising surrounding the game has long left the stores (as well as an attempt at a TV cartoon show has passed), it seems like Hollywood should have teamed with Rovio years ago to make this movie relevant or at least within the ever-changing pop culture zeitgeist of the moment. Naturally, the first question that pops up when the existence is brought to your attention is “Why?” followed by a “Could there actually be a story here?” The answers would be “I don’t know” and “Maybe, but not so much in this movie”. 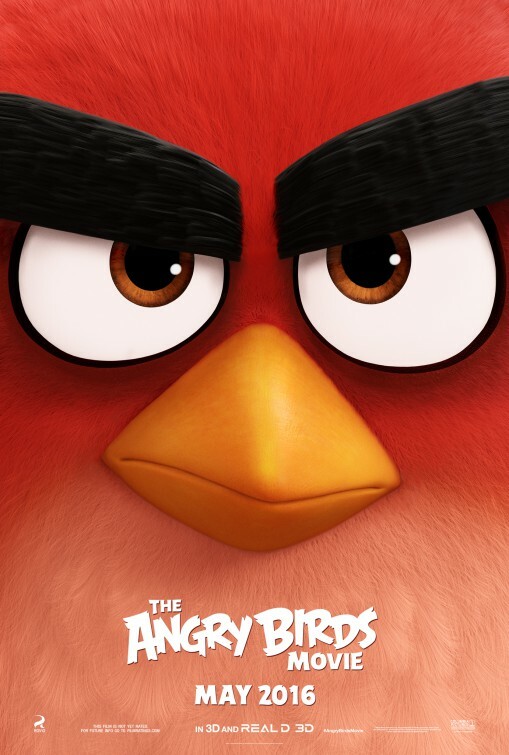 Granted, the story of “The Angry Birds Movie” – (and hey, I’m so so glad they added “The” and “Movie” to this animated feature, because just calling it “Angry Birds” would be too confusing for the movie zombies that stare at the marquee at the multiplex. They might drop down some cash thinking they’re purchasing a download after all) – is credited to Jon Vitti, who has quite the pedigree, having written a ton of episodes for “The Simpsons”, some “Larry Sanders” and “King of the Hill” as well. Not bad. But, he also had a hand in co-writing all four of those live-action/animated “Alvin and the Chipmunks” movies. Not good. As expected, at least to anyone familiar to the game, the movie’s story takes place on a place called Bird Island, a lush island inhabited by flightless birds (because that’s why you fling them at objects in the game – Ohhhh). This is where we meet cynical and sarcastic Red (Jason Sudeikis) a scarlet-feathered resident who thinks he’s alright, even though he treats everyone like crap. He has quite a short fuse and very little patience, which can be problematic living among other avian folk who are decidedly more content and chipper. 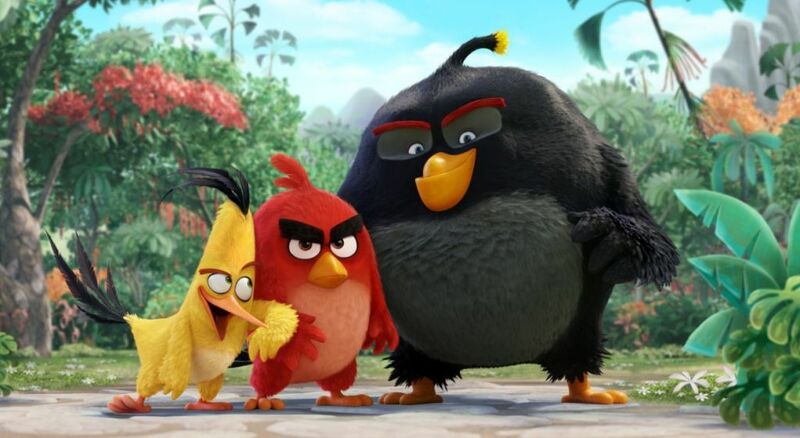 Due to a raging tirade, Red finds himself assigned to an anger management class by Judge Peckinpah (Keegan Michael-Key), taught by once-angry bird, Matilda (Maya Rudolph), where he meets a speedy yellow bird named Chuck (Josh Gad), the literally explosive Bomb (Danny McBride) and the groaning behemoth known as Terence (Sean Penn, all guttural growls). Reluctant at first, Red finds himself relating to his fellow students, but life is suddenly interrupted on the island when an unannounced pirate ship filled with an army of pea green pigs arrives, led by Leonard (Bill Hader) who offers peace and bountiful gifts, but Red becomes highly skeptical of the friendly vibes radiating from the drove of pigs. Of course, no one believes Redd, since he’s paranoid and his outbursts are commonplace among his community. While everyone else is receptive to the flowing kindness from the pigs, Red, Chuck and Bomb soon learn their ulterior motives and enlist the help of the once-idolized-now-recluse, Mighty Eagle (Peter Dinklage), to lead a war against their swine enemy. With their lack of flying ability limiting their strategy, Red and his new friends will have to be quick-thinking and resourceful in order to outsmart these cunning pigs. Yes, just like the game it’s based on, “The Angry Birds Movie” is essentially Birds v Pigs. Screenwriter Jon Vitti tries to add a story in between all the gag jokes and bird slinging in the movie, but the problem is the lead character is a real jerk. Or wait, maybe he’s just like you and me…after all. Don’t you get a little steamed when you’re trapped behind slow walkers or lose it when you’re stuck at an extremely long traffic intersection, waiting for a green light? And then there’s all those times you’re waiting in line at your local coffee shop and the person in front of you takes forever to order (and then when you do order, they get your order wrong) – am I right, or is all that just me? But here’s the thing: I don’t like that about myself. So, although the human frustrations that Vitti imbues Red are relatable, that doesn’t mean I want to follow such a character throughout a whole movies, much less expose my child to the legitimacy of anger. For the record: I don’t believe there’s anything wrong with anger. It’s what you do with it that really matters. I doubt that Vitta and directors Clay Kaytis (animator on “Wreck-It Ralph” and “Frozen”) and Fergal Reilly (who started out as a storyboard artist) really care about any kind of pro or anti anger message that kids will pick up on – and I say kids because, let’s face it, they’re the target audience here. 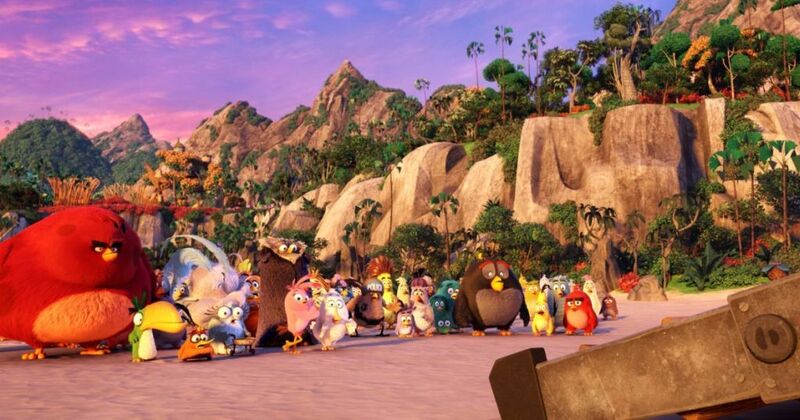 Much of what they include in “Angry Birds” can be found in just about any animated movie outside of Dreamworks, Disney and Pixar. I’m referring to all the poop, fart and pee jokes (what they call bathroom humor) that permeate these movies. I will say though that there’s an extended gross-out pee scene while Red and his pals visit Mighty Eagle that was quite hilarious and earned some legit laughs. Another other trope that shows up in many animated movies is also present here and that’s the inclusion of either of overused music (as if we need to hear Scorpions’ “Rock You Like a Hurricane” or Rick Astley’s “Never Gonna Give You Up”) or embarrassing covers, such as the wretched version of The Who’s “Behind Blue Eyes” from none other than Limp Bizkit. Now THAT made me angry. One scene that I did find quite clever was a sequence involving Gad’s super-fast Chuck, where zipping around in slo-mo and moving stuff and other birds around while time stops – just like Evan Peter’s Quicksilver had down in “X-Men: Days of Future Past“. Of course, only certain viewers will get that, but it was a fun nod to a recent movie that actually served the character and the story effectively – not just playing for laughs. But any wit and cleverness is short-lived and after a while, there’s a temptation to simply remove this app from your phone. 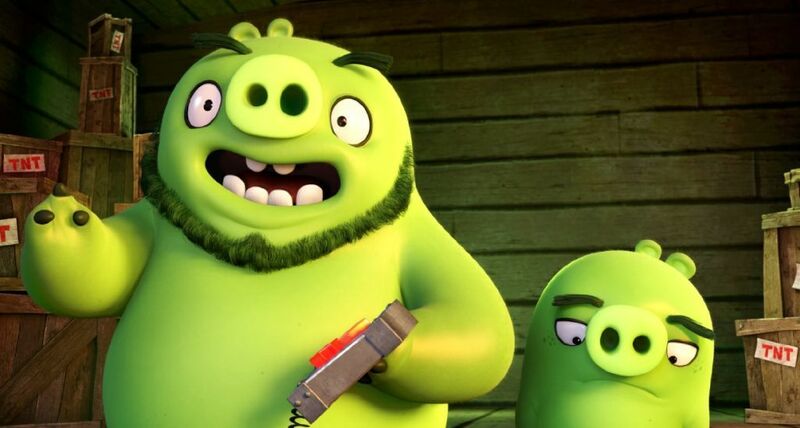 There’s no real surprises in “The Angry Birds Movie,” finding an interesting and varied voice cast powerless to bring continuous funny to a screenplay that includes too much nonsense and direction that favors chaos and meanness as a way to entertain.